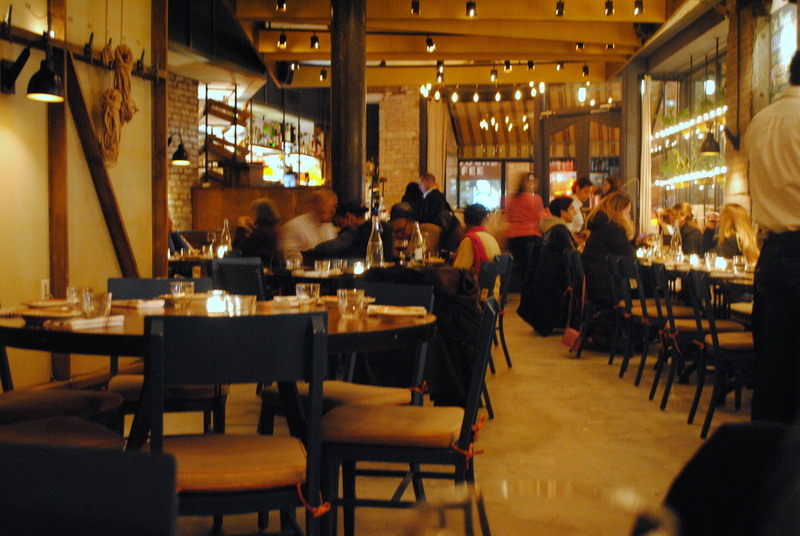 A favorite of the West Village locals, Barraca is a Spanish tapas establishment formerly headed up by Modern Spanish chef Jesús Nuñez, doling out traditional, yet well-balanced tapas, paella and of course sangria and plenty of Spanish wine. Self-defined as “rustic chic,” the restaurant boasts a large dining space with cheeky bits of exposed brick wall peeping out contrasted by stark white washed walls and plenty of ropes hanging from hooks, making me feel I was onboard some strange naval vessel and I’d have to abandon ship in the middle of my meal. For the most part the food is straightforward and predictable which is not necessarily a bad thing, although some dishes do not bear too much scrutiny and are best enjoyed as tapas should be, with a glass of Rioja in one hand and a not entirely clear head. 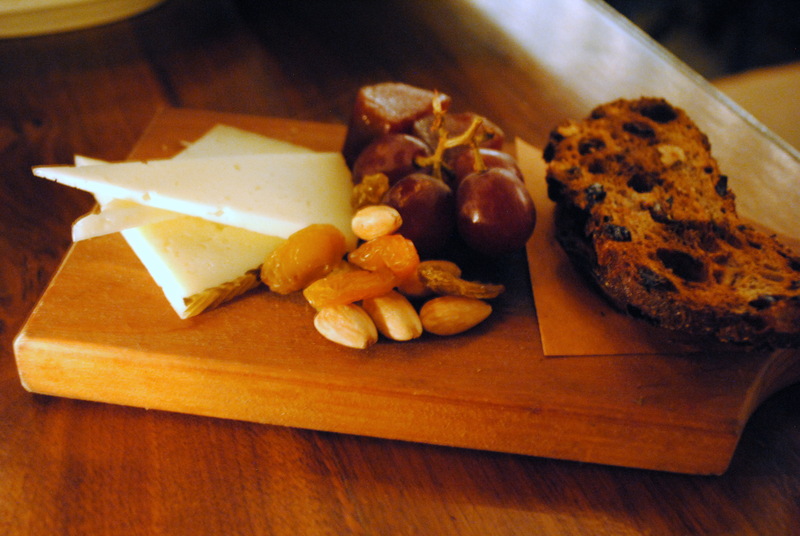 The pan con tomate goes down without a hitch as does the manchego, coupled with dulce de membrillo, a Spanish paste made from quince typically served with Manchego — sweet, fruity perfection. 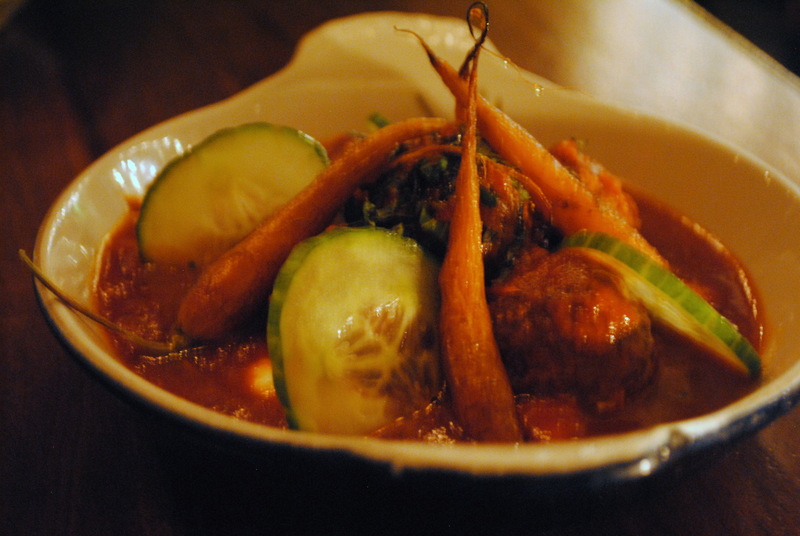 The albondigas are less than desirable, lacking that hearty richness and flavor that one expects from meatballs simmered in thick tomato sauce with roasted carrots, and in this case even the surprising addition of mint and labne cheese couldn’t make them come to life. 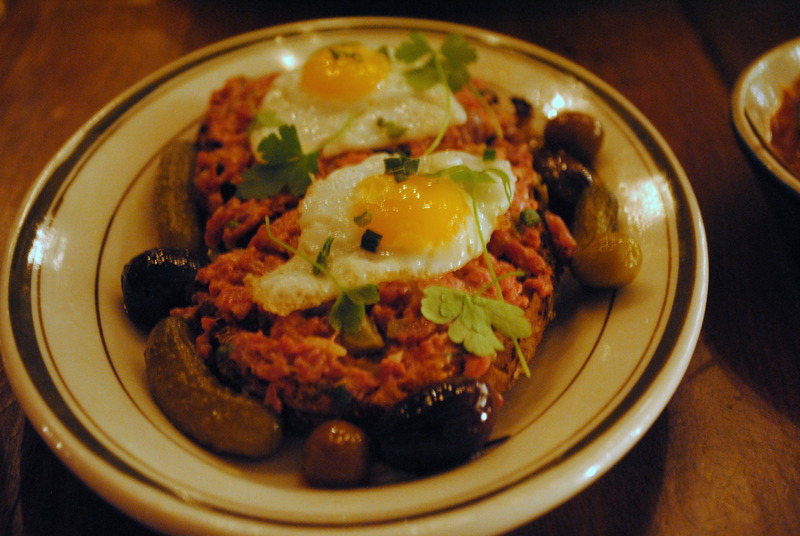 The highlight was definitely the tartar de buey with fried quail eggs on top served underneath a thick slab of toast, with plump juicy olives and baby gherkins on the side. I’ve been having a lot of great carpaccios recently, most notably beef carpaccio with rye crisps and horseradish crema from L’Artusi and lamb carpaccio with aubergine and yogurt from Dirty French, not to mention the unforgettable veal carpaccio with fried capers, tuna mayonnaise topped with rocket from 10 Greek Street (read the review here). However, this one from Barraca is definitely being added to that list of favorite raw meat dishes. 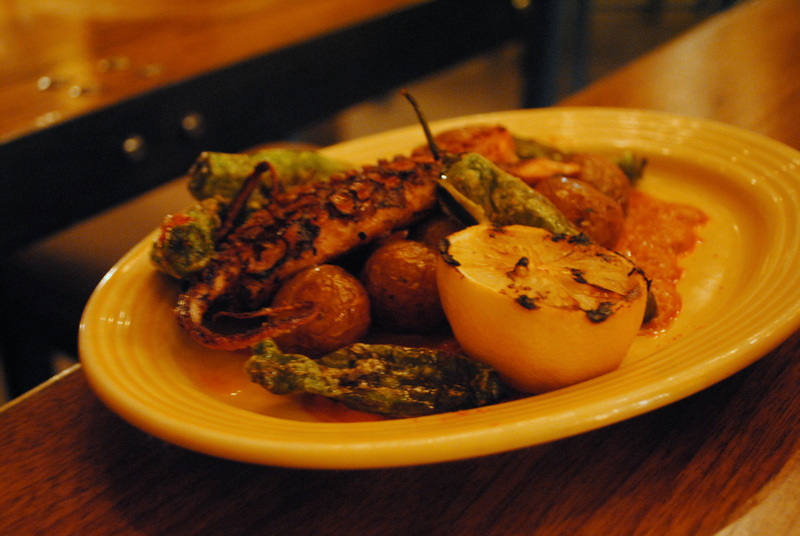 The grilled octopus is served with mojo picon rojo, a traditional Spanish sauce made primarily of olive oil, salt, water, local pepper varieties, garlic, paprika,, cumin or coriander and other spices. Served alongside charred padron peppers and baby market potatoes, there was also a charred half lemon to give the octopus a bit of citrus flavor. The octopus was decent, a bit on the chewy side despite being grilled. As always turns out to be the case with tapas, the bill adds up quite quickly. However, if you get there before 7pm you can order loads of tapas plates off the happy hour menu for just $5 a plate, in addition to sangria, wine and a selection of beers. The brunch on the weekend is quite reasonably priced so you can get all your patatas bravas and sangria for a less than an astronomical price. One of the more notable downsides to Barraca is the paella, which comes in six different types from traditional mariscos to something a little more out there, the valenciana: with rabbit, garrofon, pork ribs, string beans and snails, which are all minimum two servings so unfortunately there’s no going solo. The paella is extremely filling as well and therefore it’s not feasible to try out the tapas and order paella which is a bit irritating. 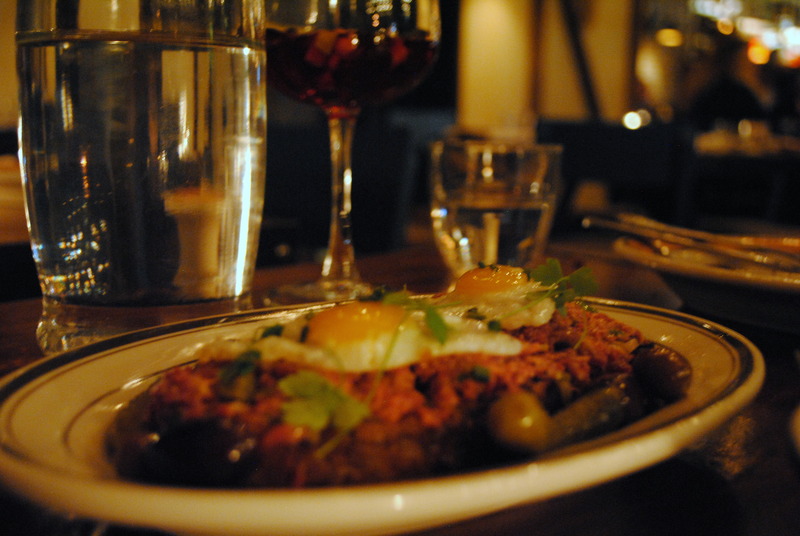 Next Spanish tapas spot for reviewing will have to be Tertulia, which is clearly gunning for NYC tapas favorite, if it hasn’t achieved that already. 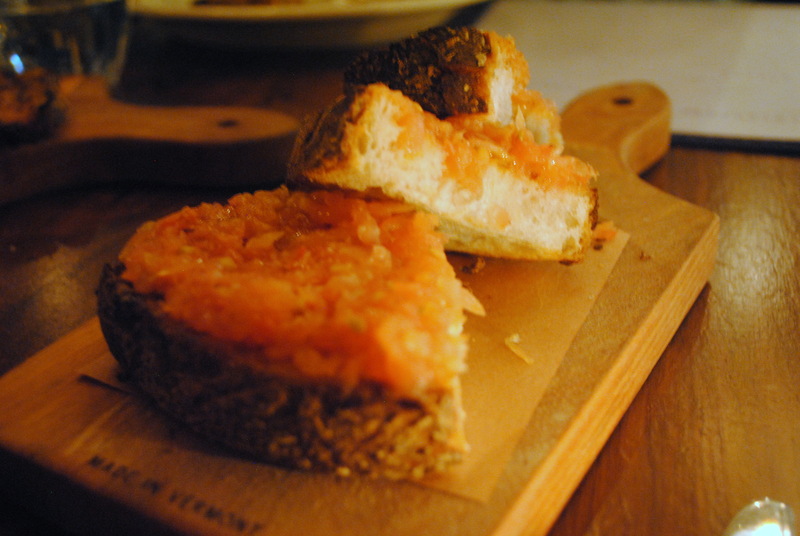 Posted in Restaurant Reviews - New YorkTagged albondigas, Barraca, dining, dinner, eats, Food, Jesús Nuñez, manchego, New York City, octopus, pan con tomate, quail egg, Restaurant, Spanish, tapas, tartar, trendy, United States, West Village, wineBookmark the permalink.